Everyone has the right to feel safe in their own home. 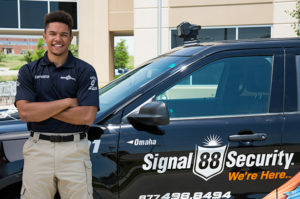 That’s something we take to heart at Signal 88 of York PA. As York’s trusted provider of apartment security services, we offer customized security solutions for property managers throughout York, Lancaster, Harrisburg, Carlisle, Shippensburg, and Gettysburg. During initial consultations for apartment security, property managers often ask us which type of security service is best for their building or complex. Is it better to implement mobile patrols? A dedicated, onsite security presence? Or would a combination of mobile patrols and dedicated personnel be more effective? The best way to find out is to speak with one of our security experts directly. In the meantime, we’ve compiled the following short guide to mobile vs. dedicated apartment security for property managers in York. Interior Patrol Needs. Buildings which require frequent or extensive interior patrols often hire dedicated staff to perform foot patrols. Exterior Patrol Needs. Mobile patrols execute exterior patrols more effectively on properties with large footprints and a high number of exterior access points. Location & Layout. The location and layout of your building can influence accessibility for security staff, along with the types of security risks you need to safeguard against. Resident Expectations. Depending on the makeup of your property’s rental community, there may be an expectation that you hire dedicated security personnel. Budget & Costs. Mobile patrol services are known for being much more cost-effective than dedicated security, costing a fraction of what properties spend on dedicated personnel. So which type of service will be the best fit for your building? That depends, but there’s a strong chance that mobile patrols will factor into your security plan. Modern advancements in mobile patrol security have made these services particularly effective for apartment security in York and the surrounding areas. Mobile patrols are a cost-effective option for apartments in low-density and medium-density areas, keeping properties secure without the sizable investment demanded by dedicated security. While some buildings still prefer to maintain a dedicated onsite security team, several of these properties are choosing mobile patrol security to patrol property exteriors and provide onsite staff with fast-response support when needed. Ready to explore your options further? Call Signal 88 of York at (717) 686-9588 today to request an apartment security consultation for your property.